Jett is Five Years Old! In celebration of Jett turning five, how about a donation? If you have ever been interested in donating to me, this would be a good time... I have an account at a nonprofit called Bridge to Healing that matches funds donated towards Jett and Oliver's alternative therapies and doctor appointments. $10 would be $20, etc. up to $1,000 per child! 2) Just click the donate button on the right and type Jett and/or Oliver Durkin. 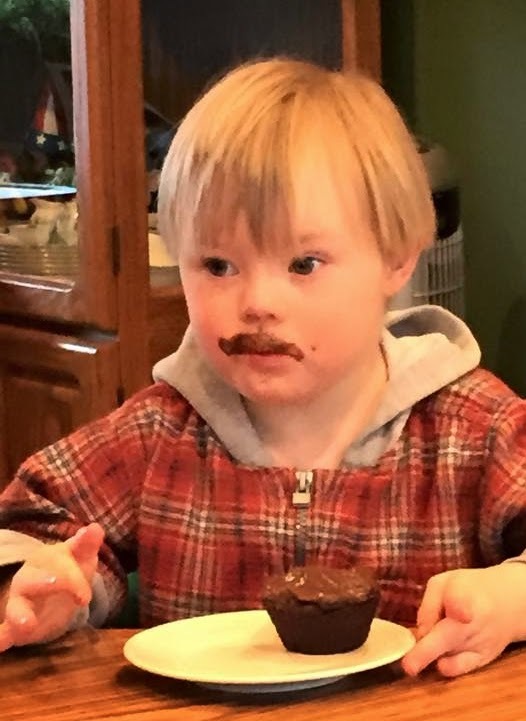 The page hasn't been updated, so at 20 months old, Jett's brother, Oliver can now eat well. Once he was able to eat, he started growing! He can now army crawl is finally attempting to get up on all fours. And Jett is doing well, but has stopped growing again. So he's the size of a three year old. I'd love to be able to afford to continue therapy and services for both boys. Otherwise, you are always welcome to donate on the right. Those donations will go toward their supplements and other care that the Foundation's Fund doesn't cover. And anytime you are shopping online, just click the Amazon banner link on the right and I can get a percentage of your purchases at no extra cost to you. Thanks for appreciating and helping to support this blog. Happy World Down Syndrome Day, Juniper! Here's a video message from Jett to his friend, Juniper Naim. Turn the volume up, click the CC and enjoy!